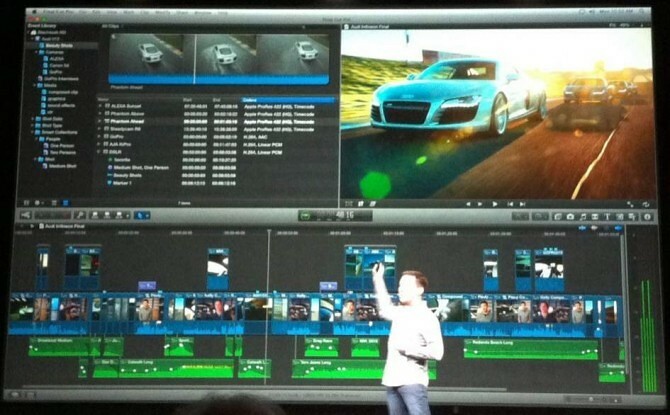 After a lot of hype, Apple did release a new version of Final Cut Pro, Version ‘X’, tonight at Supermeet at NAB in Las Vegas. It will be priced at an astounding $299 and be available in June in the Mac App Store. “Something as revolutionary as the first version of FCP when introduced in 1999″, it is rebuilt from the ground up, 64-bit, and will fully utilize all cores of all processors. Update: The Loop has three screenshots of Final Cut Pro X provided by Apple. 10:24: Magnetic timeline. If you slide a clip down the timeline, long clips (i.e., secondary audio) won’t collide with other clips. The other clips will drop down to a new drag and nothing is pushed out of sync.